Pennies In My Pocket Blog: Weddings, Birthdays and Showers OH MY! Weddings, Birthdays and Showers OH MY! I just realized this morning that I have a LOT of events coming up that I need to get gifts for.... 2 weddings, countless birthdays and a baby shower. Oh my. Well, I got this email today letting me know about $4 or FREE Standard Shipping at Things Remembered. I love this store because I love anything and everything PERSONALIZED! - I love the dragonfly card holder. So cute! Great gift for a business woman. Also, I'm in love with the Crystal Heart Key Chain. That would make a pretty gift for a young lady just getting her driver's license....or a lady in her 30s who loves sparkles and hearts. ;-) There is also a photo book key chain...perfect for the Grandma who loves to show photos of all the little ones! -Not too impressed with the selection for men on sale. My hubby does like it when he gets fancy pens, so I guess those aren't bad. 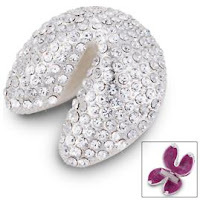 -OK, for some reason I'm just totally in love with the fortune cookies covered in rhinestones! Love that you can put your own message in it. How cute! You could use that for a lot of different occasions, not just weddings. I see a lot of personalized frames and photo albums...can't go wrong with that for a wedding gift! -All sorts of frames for all sorts of occasions. 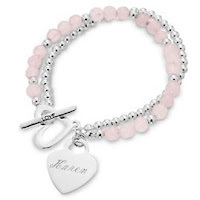 $4 or FREE Standard Shipping* on Personalized Gifts for a LIMITED TIME ONLY! *Spend $125 or more and receive standard shipping for FREE! This offer is subject to change at any time. If I throw in a Christmas present or two then I'll for sure get free shipping and 20% off my entire order -- LOVE LOVE LOVE that! What a blingy fortune cookie! Things Remembered is a GREAT store!!! Thanks for all the ideas! The fortune cookie is too cute. That fortune cookie is so cute. But I'm a sucker for rhinestones! There are some great finds on that site. I have a lot of birthdays coming up, too. I think I'm going to get some stuff, get 20% off with the free shipping. Not bad at all. Thanks tons! I'm getting a LOT out of the way today! good grief that fortune cookie is adorable! I saw you on jill jill bo bills blog i cicked an now i am thinking you should join us for the secret santa soiree cuz you can get the MOST bang for your buck and well I am the host and I am personally inviting you! thanks for visiting! that means so much coming from a wedding planner! Thanks so much for stopping by to visit today! I hope you made yourself at home. I've been here all of 30 seconds and I already LOVE your blog. I am a sale junkie myself and I look forward to reading about your finds! GREAT blog!! I will visit often! The dragonfly case is great! Too bad I don't have a reason for it! TR was my go to store years ago for wedding gifts. I loved their personalized throws. I love your blog header, it's so chic. Have a great night. I have a list I need to find gifts for as well! BTW, do you ever find deals for Crane stationery? I noticed my monogrammed note cards are running low. I need to reorder. I dread it every time....but I love the engraved ones. I use the plate from our thank you notes from our wedding! Best investment ever! Oh, how I do love your blog so. *sigh* You gave me a clearance code for jewelry. Thanks for stopping by! I watched Ina Garten on Food Network this afternoon. You're so right....she is so peaceful and relaxing! or you can just go to my Mary Kay Website and get gifts on sale!! There is always a sale when you shop on my site. Whether you are looking for the bride, groom, birhday gal or guy, there's something for everyone:) Always Free Shipping! 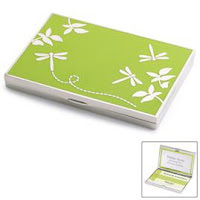 Oh, I am loving that dragonfly card holder - perfect for a friend - just perfect!! and I totally need a gift for her! Awesome timing!! Thanks for the BDay wishes!! Hello Hello - Is site different since the last time I was here? Did you change the design? Maybe my memory is just fried! Talk to ya later, thanks for posting the orange chicken recipe - I have one that I've used a couple times, and I just don't like it - so I think I'll replace yours with my old one! As you all know, it is the Christmas coming up, I have a lot of commitments regarding shopping. I think I found the blog at the right time. I liked the jewelery clearances especially a lot. Thanks for sharing nice resources here.